Climate change is likely to increase the prevalence of diseases transmitted by arthropods, and could even contribute to the emergence of new ones, according to two recent studies. The studies are the latest addition to a substantial body of research suggesting that a warming world will face more vector-borne disease. They come on the heels of research showing a precipitous decline in insect populations over the past several decades. That research suggests important ecosystem services ranging from crop pollination to food for birds and other wildlife species are at risk. At first, those two lines of research may seem contradictory. But overall, they paint a picture of a future with fewer of the arthropods that benefit humans, and more of the ones that spread disease. That we’re remaking the world to be less suitable for ourselves is one of the ironies of the Anthropocene. In one of the new studies, researchers investigated the links between climate change and Lyme disease, an illness that is caused by a bacterium transmitted by ticks . Lyme disease, which can lead to heart problems, arthritis, and neurological damage, has been on the rise in the United States over the past three decades. Researchers already know that a warming climate is likely to lead to more Lyme disease. The U.S. Environmental Protection Agency even uses Lyme disease cases as a climate change indicator. But the new study puts some numbers to the phenomenon. Igor Dumic of the Mayo Clinic and Edson Severnini of Carnegie Mellon University gathered data on temperature, precipitation, and Lyme disease cases reported in 468 U.S. counties between 2000 and 2016. The counties were all in the 15 Northeastern and Upper Midwestern states where more than 95 percent of Lyme disease cases in the country occur. They found that the rate of Lyme disease begins to increase when a county’s average annual temperature exceeds 5 °C, and peaks in counties with annual average temperature between 9 and 11 °C. This pattern is likely due to a combination of tick biology (the animals are inactive and survival rates are lower at low temperatures) and human habit (people tend to spend more time outside as the weather gets warmer, but avoid the outdoors when it’s too hot). As the climate warms, rates of Lyme disease are likely to increase in counties where the illness is already common. With moderate greenhouse gas emissions, the study area will see a 21 percent increase in Lyme disease by around the middle of the century, the researchers calculated. “Our results imply that climate change will have a sizable impact on the number of cases of [Lyme disease] in the United States in the coming decades,” the researchers write. Moreover, Lyme disease may become established in new areas, as annual average temperature increases to transform these areas into high-incidence zones. In a second study, an international team of researchers assembled a combination of taxonomic data, fossil evidence, and DNA sequences to track how rapidly new mosquito species have emerged over the past 195 million years . Then, they analyzed how variations in speciation rates match up with changes in global temperature and atmospheric carbon dioxide concentration over time. They found that in the past, new mosquito species formed at a faster clip when levels of carbon dioxide in the atmosphere were higher. Speciation rates were also greater during warmer periods. It’s not clear whether high temperature and high carbon dioxide drove mosquito speciation directly. For example, they found that mammal speciation is also correlated with mosquito speciation – little surprise, since many mosquito species feed on the blood of mammals. Even so, the researchers say, past patterns of mosquito speciation suggest that the current high levels of carbon dioxide in the atmosphere and warming temperatures “may similarly stimulate rates of speciation” in mosquitoes. Worldwide, 1 million people die each year from mosquito-borne diseases. 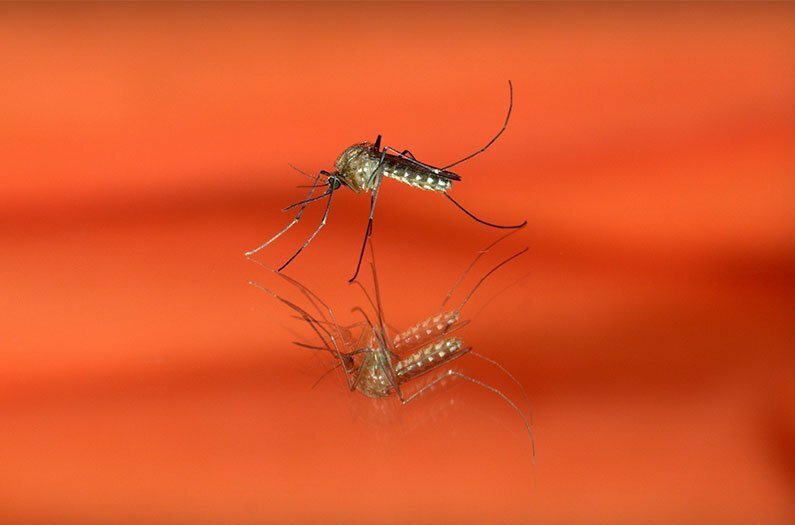 Researchers have known that mosquitoes are likely to become more abundant and widespread with climate change, possibly leading to the re-emergence of diseases that have been eradicated from certain areas. The new research suggests something more uncertain, but also more chilling: whole new diseases. If new mosquito species do emerge, this “may, in turn, increase the probability of new vector/pathogen interactions arising,” the researchers write.